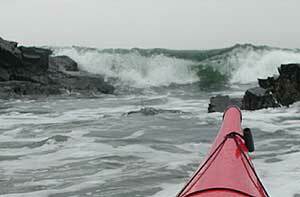 Visit the Maine Page -- A listing of Maine kayak & canoe trips. View our listing of Guided Trips. Submit a favorite paddling photo for use here. "Whatever you have seen, it is for the good of all the people that you have seen it." Waterways is a site created by paddlers, for paddlers. We list descriptions of fresh and salt water kayak & canoe trips in Maine, New England, the U.S., and beyond. Our trip descriptions include road maps, paddle maps, photos, trip details, distances, safety tips, and more. Links to other paddle sites are included. We welcome contributions of your favorite trips. Our emphasis is on trips that can be paddled in a touring kayak, but some of our trips are suitable for those who paddle river kayaks or canoes, or who row. (For example, class 2 and easier river trips are included). If you can paddle it in a touring kayak, we want it. and I handed the photo. Sixty-eight years old, fifty on the river. If he could not guide me, nobody would. His answer would be definite for me. (Recent comments in our guestbook)"Lahaina, Maui, Hawaii . . . The Hawaiian Archipelago. Certainly challenging for the experienced paddler, should you be interested in crossing the channel waters between Maui, Molokai and Lanai. Trade winds of 20-25 knots can be expected 90% of the time, and traveling inter-island is done primarily at night when trades will back off. I like paddling the Hawaiian Archipelago because over the past 30 years I primarily paddle alone. Crossing open-ocean channels is demanding, exciting, and certainly fulfilling after you reach your destination. I also like the Hawaiian Archipelago because of the warm weather of which allows me to eat and sleep from my kayak for several days while during the winter months, North Pacific Humpback whales lie by my side. Aloha, Richard Roshon"
Where's you're favorite place to paddle? Please rate Waterways between one and ten, with ten being tops for the SEE Kayak directory.